Wholesale Personalized Ruler Calculators Custom Printed in Bulk.Promotional, Inexpensive. Budget Prices in America. 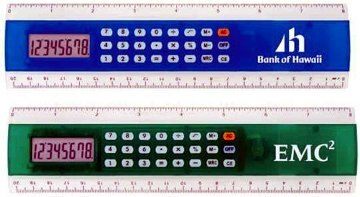 Bulk ruler calculators -calculator rulers, custom imprinted with your logo or message. We also supply wholesale blank (not imprinted) ruler calculators for $2.59 each. Budget Prices in the USA and Canada. American clients pay no taxes, We will send you a proof for your approval before production. Prices include a 1 color, 1 location screen imprint. Assortment of colors is allowed. If you require additional colors or imprint locations, then you have to add $0.25 per color, per imprint location, per unit, plus an additional Setup Charge of $40.00 per color, per imprint location. Extra Imprint Colors: add $0.25 per color, per item. Typical Production Time: 9 days after artwork approval; 3 day rush production is available: contact us. Blank ruler calculators ship next day.